Qian, T., Reeder, P.A., Aslin, R.N., Tenenbaum, J.B., and Newport, E.L. 2012. Exploring the Role of Representation in Models of Grammatical Category Acquisition. In TBA (eds.) Proceedings of the 34th Annual Meeting of the Cognitive Science Society (CogSci12), TBA. Austin, TX: Cognitive Science Society. Kleinschmidt, D. and Jaeger, T. F. 2012. 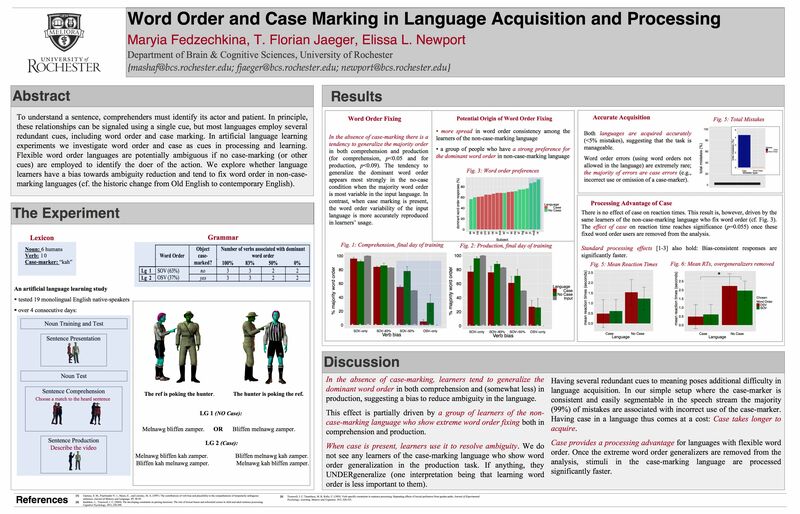 A continuum of phonetic adaptation: Evaluating an incremental belief-updating model of recalibration and selective adaptation. In TBA (eds.) Proceedings of the 34th Annual Meeting of the Cognitive Science Society (CogSci12), TBA. Austin, TX: Cognitive Science Society. Kleinschmidt, D., Fine, A. B., and Jaeger, T. F. 2012. A belief-updating model of adaptation and cue combination in syntactic comprehension. In TBA (eds.) Proceedings of the 34th Annual Meeting of the Cognitive Science Society (CogSci12), TBA. Austin, TX: Cognitive Science Society. And, thank you, dear Google. This entry was posted in Papers, Presentations, etc., presentations and tagged adaptation, cognitive science society, cogsci, cool talks, Kleinschmidt, learning, Qian, research, sapporo japan, science, selective adaptation. I still don’t know how I managed to not ever have been to CogSci before, but this year it will happen. Thanks to Austin Frank (BCS, UofR), Carlos Gomez Gallo (CS, UofR), and Neal Snider (Ling, Stanford University), a bunch of us will be presenting at CogSci08 in Washington, D.C. in July. I will upload the papers soon. This entry was posted in articles, HLP lab, Papers, Presentations, etc., presentations, Uncategorized and tagged cogsci, psycholinguistics.